The ancient water systems of Jerusalem have a complex history. One of the outstanding features of one of the systems is a series of passageways that make up "Warren’s Shaft"(= "the Jebusite Water System"). From inside the city wall residents would walk down an "arm/elbow-shaped" diagonal sloping tunnel that was carved into the bedrock. 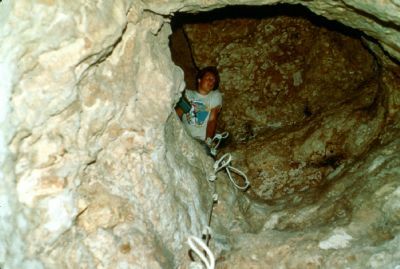 Then they would lower their containers by rope either down "Warren’s Shaft" or down into the pool recently excavated by R. Reich. In either case the water was brought from the Gihon Spring to either of the vertical drops via horizontal tunnels. This system was constructed so that the residents of Jerusalem would not have to go outside the city walls in order to access the fresh water of the Gihon Spring. Reich, Ronny, and Shukron, Eli. "Light at the End of the Tunnel: Warren's Shaft Theory of David's Conquests Shattered." Biblical Archaeology Review, vol. 25, no. 1 (January/February, 1999):22–33, 72. Reich, Ronny, and Shukron, Eli. "The Excavations at the Gihon Spring and Warren's Shaft System in the City of David." Pp. 327–339 in Ancient Jerusalem Revealed: Reprinted and Expanded Edition, ed. by Hillel Geva. Jerusalem: Israel Exploration Society, 2000. Shanks, Hershel. "I Climbed Warren's Shaft (But Joab Never Did)." Biblical Archaeology Review, vol. 25, no. 6 (November/December, 1999):30–35.